Most neck lumps are enlarged lymph nodes. Sometimes, the lump is a congenital cyst, an enlarged salivary gland, or an enlarged thyroid gland. 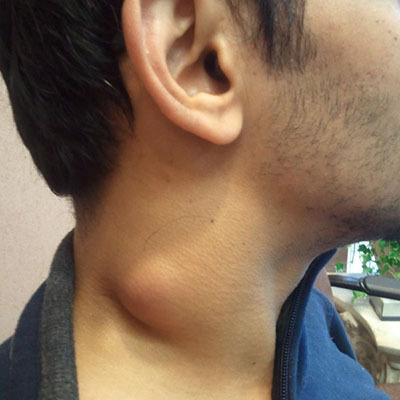 One or more neck lymph nodes often enlarge in response to an upper respiratory infection, throat infection, or dental infection. These nodes are soft, not tender, and typically return to normal shortly after the infection goes away. Sometimes, bacteria can directly infect a lymph node this is called lymphadenitis. Such infected nodes are quite tender to the touch. Certain systemic infections typically cause multiple lymph nodes to enlarge, including some in the neck. A much less common but more serious cause of enlarged lymph nodes is Cancer. If you are concerned that you have had a lump in the neck for more than 3 weeks you should see your GP, who will arrange for you immediate referral to a specialist.